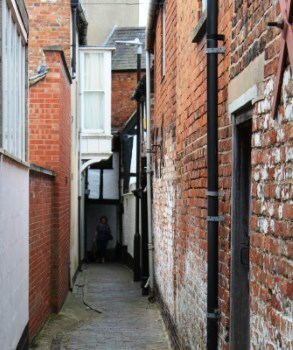 Stephens’ Alley is opposite the Black Bear, and the last alley along the High Street. 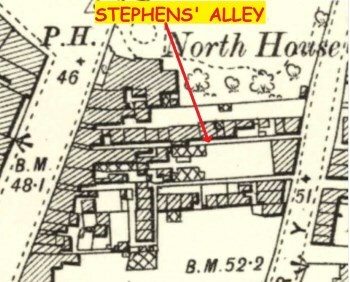 Mr Stephens was a hosier, and the alley contained his business. There were six occupied cottages in 1905, but had been more. 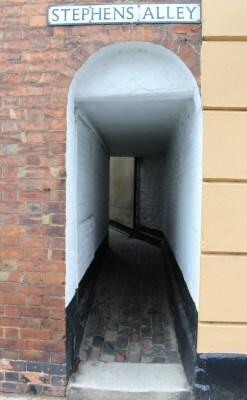 Some had been converted to other uses, and in the middle of the alley is a building which was a workshop used to maintain stocking frames, and as a store and factory. The stocking business was weighted towards the ‘master, who rented out both cottages and frames to the stocking makers, who worked on piece-work, being paid on Saturday, after their rents had been deducted. Mr Stephens was described as a ‘Respectable man’, but his fortune didn’t stay with his family. The last Stephens was Tewkesbury’s lamplighter. John, known as ‘Lampy’ seemed to have been mistreated by his employers. After thirty years’ service, the number of lamps had risen considerably. His job consisted of carrying a ladder to each lamp to light the gas at dusk, extinguishing half of them at 11pm and the rest at dawn. He asked for a rise, but he was sacked instead! When a replacement couldn’t be found, he was re-instated, with the promise of a light on a stick to make life easier. When he retired, after 58 years, in 1886, he applied for a pension, to be told that he was officially employed by the gas company, not the Council! He didn’t have an entirely unblemished record. In 1869, he had the misfortune to be the first defendant before a new recorder (judge) at the Borough quarter sessions, accused of stealing a meerschaum tobacco pipe from Henry Treasure, a deaf and dumb man, in the Brewer’s Arms. He was sentenced to a month’s hard labour. No. 71, the front house, was in the distant past a pub, the Crown, and in 1812 possibly a fish shop. It became a residence, and in the twentieth century was converted to offices. The opposite side of the alley was occupied by 72 High Street, Enderby House, and its garden, which extended to Oldbury Road. Mrs Jesse Preece lived here. It was she who gave the Philharmonic Hall in Barton Street to the town in memory of her brother, George Watson. In 1916, her estate was sold. A large part of the garden was later developed, and now contains a tire workshop; the only modern intrusion in the alley, discounting the ‘stucco’ rendering and wall repairs to No 72. Stephens’ Alley has had an unremarkable history, and retains a lot of its charm.